There are a few dating sites that stand out for various reasons, and Wealthy Men is one of them. It is a wealthy dating website that only accepts successful men and gives women peace of mind as they search through verified photos, professions, and incomes. Wealthy Men also gives successful men the ability to reach out to women who have a verified photo and are interested in having a relationship for exactly the person that they are. Whether you are looking for someone to flirt with, travel with, or get married to, Wealthy Men is a place that can help you find that perfect someone. The most unique feature of this wealthy dating site is that they offer a 3-month guarantee to their paid members. If you do not find someone in 3 months, you will get a free membership. Keep reading this review to learn more. Whether you are looking for someone to date, travel with, or just flirt with, you can choose exactly what you are looking for during the signup process. This will ensure that you let your matches know who you are and why you signed up. You also get to write an ‘about me’ section and fill in an ‘ideal person’ section to ensure that you further get your point across. We know this is important to successful men and women who are not willing to play any games or leave anything up to chance. For women, Wealthy Men is unique in that it requires you to specify your profession as well also your orientation right up front. This means that whether you are straight or bi-sexual, you can get on the site and look for someone who matches your ideal date perfectly. For men, Wealthy Men requires you to choose your profession and income. The lowest income available to choose from is $85k-$159k/year and the highest is over $2m+/year. All of the prices are the same for both men and women. If you don’t want to opt-in for a subscription plan, you can choose to do a 3 month or a 6-month membership. Note: This plan doesn’t allow you to send messages to free users, which is why the price is different from the subscription based membership below. All plans come with a 3-month guarantee that you will meet someone within 3 months or get a free membership. We also noticed that for both men and women, a pop-up comes up when you sign in that helps you flirt with people who fit your search criteria. This is an interesting feature that can help you connect with that successful man or beautiful woman quicker. You also have the choice to not do that and let members contact you instead. While you can’t look at profiles without a membership, there is a feature that helps you to indicate whether or not you would like to meet a member. It is on the right side of your dashboard, and it simply asks you if you want to meet her or him. All you do is click on ‘yes’, ‘maybe’, or ‘no’, and they will receive a message that you are interested. You can also access this feature through the ‘Wants to meet you?’ link. Lastly, one unique feature we found was a ios app. On this app, you can see your dashboard and view your messages, who’s online, who’s viewed you, and who wants to meet, as well as all the other things you can view on your main dashboard. Does Wealthy Men Accept Sugar Daddy Relationships? There is nowhere on Wealthy Men that says they do not accept sugar daddy-type relationships. Furthermore, when you sign up, you have options such as ‘travel partner’ or ‘dating’ or ‘meet in person’ to choose from in regards to what you are looking for. As long as you are clear about the type of relationship you are looking for, it seems that you can have any type of relationship you are looking for. Women are able to verify their pics by uploading a photo and then comparing it to a webcam shot. Any woman will want to use this feature. It’s free and it allows successful men to see that the woman they are interested in is serious about being open and honest and meeting someone. Men are able to verify their photo, income, and profession. In order to verify your income, you have to attach a tax return or bank statement, as well as a photo ID. In order to verify your profession, you have to attach a business card or company letterhead, as well as a photo ID. All information is kept safe and secure. Again, this is free and it allows successful men to show beautiful women that they are serious about finding a match. Wealthy Men is a site for the wealthy. We understand that. But, for women it would be nice to view men’s profiles without having to become a paid member first. In fact, it would be valuable for both men and women to be able to see the profiles of other members without having to pay first. It is hard to know whether or not you are going to like someone simply by looking at their picture, age, and a small bio about them. Also, if you have read any of our other reviews here on Millionaire Dating Sites, you will know that we are not a fan of ads. When we first signed up, a new link opened up to another website for matchmaking. And, on the dashboard, there is an ad for an app which is a little distracting. Lastly, we really believe that millionaire dating sites (and all dating sites) should have a blog, forum, or chat feature. This is a way to help members get to know each other better without having to directly interact with each other. As of this review, they do not have any such thing. Wealthy Men doesn’t outright claim how many people they have on the site at any given time, although you can click on the ‘online now’ link to see how many people are currently online. When we tried it, we got over 120 matches every time. That seems like enough matches to go through per day. A quick peek on Alexa told us that Wealthy Men is doing well and improving in popularity. Much of the traffic seems to be from the United States, and while there are some men on the site, it seems to be at a 1 to 3 ratio with women. That means that wealthy singles looking for a beautiful woman will have a lot of options to choose from on Wealthy Men, and beautiful women will need to verify their profile picture in order to stand out among the crowd. Furthermore, creating an interesting profile is going to help you make your mark against the other women. For women, you can search for men by age, location, photos included, as well as whether or not they have a verified photo, profession, or income. You can also do an advanced search to look for a man who is a certain race, religion, body type, profession, and height. And you can search by what a man is interested in as well as whether or not he is bi-sexual. You can also search by who is online and who is a new member. Lastly, you can search by username. For men, you can use all of the above, but only the verified photo section is available as women don’t have to verify income or profession. 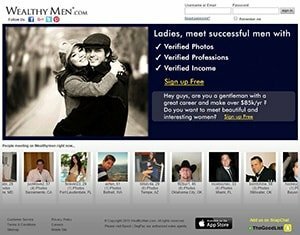 The verification process provides some safety for a millionaire dating site. There are always women and men who are willing to take advantage of this kind of site, so verification makes it easier for both men and women who want to know that they are dealing with real people looking for real matches. All information you submit will be kept private; however, it is important to remember that anyone can log in and see your profile with a membership. Wealthy Men cannot protect you against certain people finding out you are using the site. The design is pretty standard for a dating site, with the dashboard having all of your information easily accessible and important links clearly marked. The colors of the site could be better, and it can be hard to see some of the text being light on a dark background, however, it is not completely distracting to the overall experience. In your dashboard, there is a help link up top that you can click on. This link is your way to get in touch with Wealthy Men quickly to send a message about a bug or problem. However, there is also a customer service link at the bottom where you can find all the numbers you need. There is also an email and live chat address. In short, they obviously take their customer very seriously and have many different ways for you to contact them. Whether or not you will get quick interaction with them is a different story. Some users were saying that they had to wait a while to talk to someone, which can be very frustrating if you need an answer quickly. During our review, we had an easy time figuring out the site and using it. The signup process was easy. The search is easy to use. You can clearly see how many messages you have as well as how has viewed you, winked at you, or wants to meet you. You can update your profile easily and quickly see who is online. In short, anyone will be able to use Wealthy Men without any hassle. The only problem is the ads on the site. You can get distracted by them and because the first ad takes you to a completely new page, it can be annoying on a mobile phone to get back to where you started. Wealthy Men could definitely use some upgrades. For instance, the design of the site could definitely be worked on, and the ads could be removed. Also, during our review, we noticed that the lack of a blog, forum, or chat feature really made getting to know the other members more difficult. While not every dating service has these features, we find that they make the membership more valuable. Moreover, not being able to see the other member’s profiles until you become a paid member is a bit of a letdown. Many people want to see what they are paying for before they actually pay. And other potential members may leave in favor of another dating site that allows them to see profiles without paying. On the flip side, Wealthy Men offers the ability to verify photos, profession, income, which is very important when trying to figure out which members on the dating site are serious and which ones are not. This is a free service to members, so anyone who is really serious about finding a match will take advantage of this feature. And, if you upgrade your account, you can send messages to free members who may not otherwise reach out to you. Plus you can get featured in their dashboard and in their search results. All of this helps you stand out more and get in front of the people you want to get in front of. What Type Of Person Would Be Perfect To Date A Millionaire? How to Date Rich Men and Get Paid? How to Get a Rich Man to Notice You? He was the first person to contact me on MM, and our first conversation was about Plato. I knew when I met him that he was the one for me, and while he may not be there quite yet, he disabled his account, and I will do the same after I submit this, since we are taking this next step in our relationship together. This was my first adventure in dating online, so I have to say being on the right site, at the right time, yields results. And MillionaireMatch is the right site.